Well, it's really not the end of the world, unless you believe the whole Mayan calendar thingy. Which I don't. Not really. I guess we'll see. 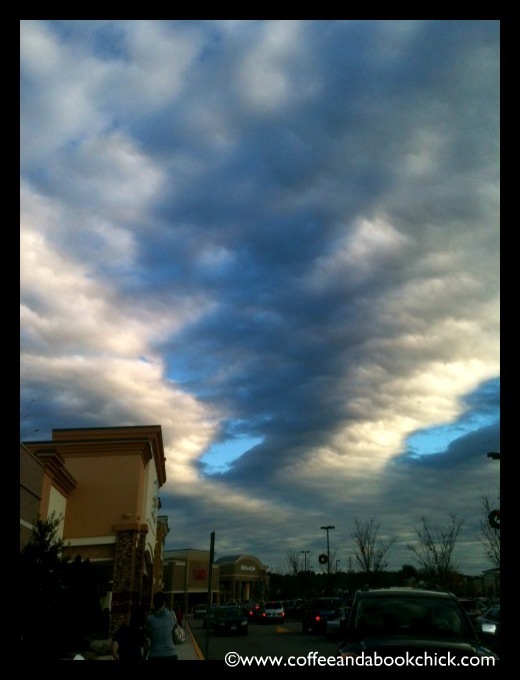 This was the sky above a shopping plaza in Virginia Beach a few days before Christmas. The crowd did make me want to run and hide, so I just kept looking up. Nothing was adjusted on this, other than adding a border. What a moody, atmospheric sky! The light and shadow make such an amazing contrast. I've taken a number of summer cloud pictures but I forget that the winter clouds can be quite beautiful as well. That is gorgeous and mesmerizing! This is so very pretty - the light and dark contrast. Such a simple thing to look up and snap a photo. Why don't we do it more often? It does look rather creepy! Wow! And I love that nothing was even adjusted. Just amazing! Beautiful! i love moody skies! Oh, that is lovely! The clouds almost look like a series of smoke trails filling the sky. I think this is a wonderful photo! What a wonderful, dramatic sky! Anything could happen under a sky like that. The sky does look very apocalyptic! The colors and cloud formations are incredible! That has an ominous look to it. I can just hear someone out of eyeshot yelling, Run! Very impressive photo; powerful looking. The sky shot is amazing. Wonder what the weather which followed was like? Awesome, and it is a little scary but definitely not as much as pre-Christmas crowds. I would keep looking up too! Beautiful. Very nice! Clouds can be so prety and so interesting.